Effective Mooring | LIBROS NÁUTICOS | Maniobra | Librería Náutica cartamar. Libros Náuticos. Cartas Náuticas | Libreria nautica Cartamar. Libros nauticos. Cartas nauticas. 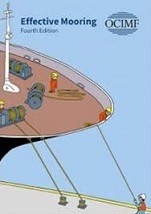 This book gives seafarers general guidance on how to stay safe when mooring a ship. It is written in an easy-to-understand style for seafarers worldwide. More detailes technical information on the design and maintenance of mooring systems in in OCIMF's Mooring Equipment Guidelines, fourth edición (MEG4). Althouh this guide in mainly for use on tankers, a lot of the information is also valid for other ship types, including small vessels and barges. This guide is not a book of rules. It gives recommendations on safety and good operating practices. Where stricter international, national or local regulations apply, they take priority.